This week’s pick is Fandango Movies – Times & Tickets. There are a number of iPad and iOS apps that help you get information on movies playing nearby, but this is by far and away the best of them. Fandango Movies is packed full of tons of great features and offers a great UI that makes it easy to do everything from finding the movies you want to see to booking your tickets for a showing. • Or securely store credit card information to your device – it’s your choice! 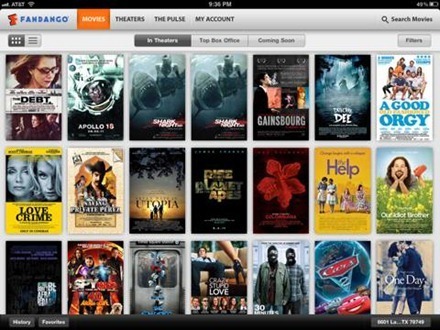 • The Pulse – Want a snapshot of what’s selling on Fandango? Then tap into The Pulse! 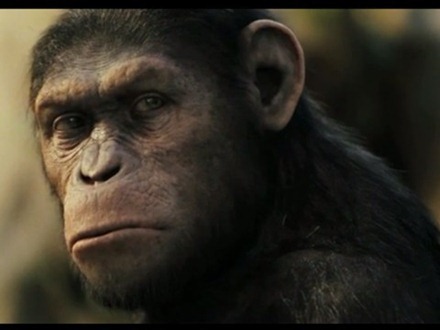 • Don’t have a Fandango account? Create one from the app for quicker ticket purchasing, ability to write movie reviews, order tracking and more! The app offers lots of trailers for most popular movies. They can be toggled to full screen and there’s support for AirPlay video, so you can view them on your HDTV if you have Apple TV. It’s easy to find local showtimes for all the movies currently playing in your area, and to buy tickets to collect when you arrive at the movie theater. It’s great that the Reviews section for each movie offers not just critics’ reviews but also fan reviews and tweets about the movie. The Pulse section on the iPad is very cool. It lets you see what’s hot and what’s selling right now all around the US. It helps you spot some movies you might not have noticed. 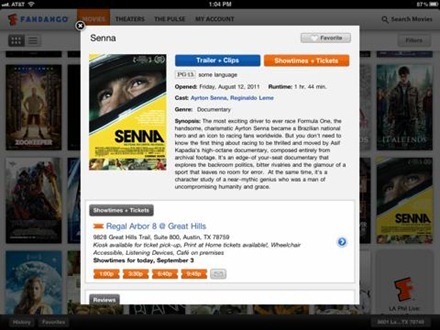 Today I spotted a documentary on Ayrton Senna, simply titled ‘Senna’ that looks excellent. There are notifications that you can toggle on / off for big movie openings in your area and reminders to rate a movie once you’ve seen it. If you’re even an occasional movie goer, this is an essential iPad app. It can help you see what’s on, make a good choice on what to see, and get your seats without the hassle of lining up for popular releases. 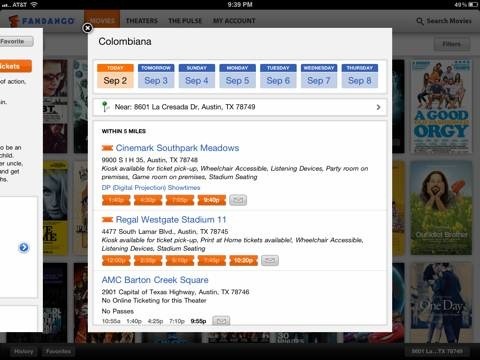 Here’s an App Store link for Fandango Movies. It’s a universal app, designed to run on both the iPad and iPhone. Hey Patrick, great looking app, I especially like how it sends you alerts when a movie on your ‘must see’ list finally hits theaters. I’ll be installing this app for sure, thanks for the heads up! My pleasure. I’ve been a fan of this app since its iPhone days and it just keeps getting better.